There are all sorts hidden secrets in a lot of different games that people figure out eventually, but Destiny's latest hidden secret seems to have gamers completely stumped. The reason so many people are stumped is because they have no idea what the secret does. Kotaku did a detailed write-up on the secret and how it was accessed. It appears during the King's Fall raid, the newest addition to the game that came with The Taken King expansion. If you're playing on the Xbox console you have to activate the lights in a different order, supposedly: 416523. Once the lights are activated there will be a door on the opposite end of the room that opens up across from the entryway. It's suggested that a player blade-dance their way across the chasm to get to the room to allow the others to enter. There's a somewhat vague walkthrough available from PlanetDestiny where they discuss how they got into the secret door and how they need more data! Given that this is the internet and the world is digitally connected, I wouldn't give it long before Destiny die-hards pool together their collective knowledge and figure out how to solve the riddle of the game's newest conundrum. 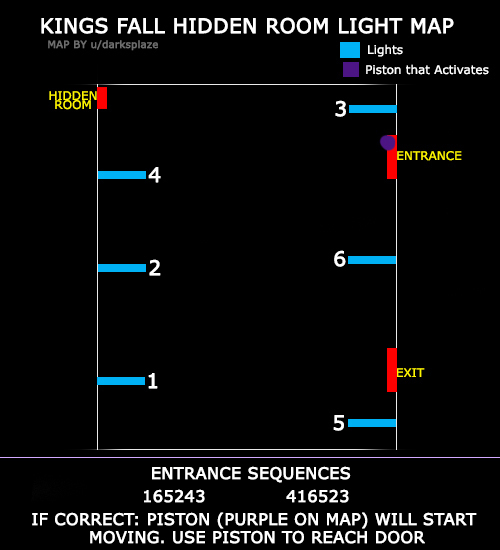 I'm sure a lot of players would love to figure out exactly what the secret room is all about and what's so special about it. In fact, some have already begun experimenting with the contents in the room and figured out that when putting the relic into the statue and lighting up all six runes will give the entire party an Overcharged buff. Funnily enough, no one knows what the buff is for. The buff is used later on during the fight against Oryx in the Taken King's raid, but in the room with the giant pistons it serves no purpose whatsoever. Some believe it may be used for some other event but they haven't figured out what. This is probably one of the few times that Destiny has become vastly interesting just because there's some element to the design that people have not been able to figure out. The game is usually fairly straight laced with its content and leaves very little room for the kind of interesting development that this hidden secret has unveiled. For die-hard Destiny fans I'm sure they will figure this out eventually, but for normal gamers who just want to get through the raid and get some loot, this is something that's probably already being pushed to the back of their minds.